Our boarding facility is fully licensed and insured against theft. Our vivariums are all constructed from hygienic materials which are regularly sterilised. We do not use porous wooden melamine vivaria in our boarding facility. Strict protocol is observed so cross contamination between boarders is kept to a minimum. 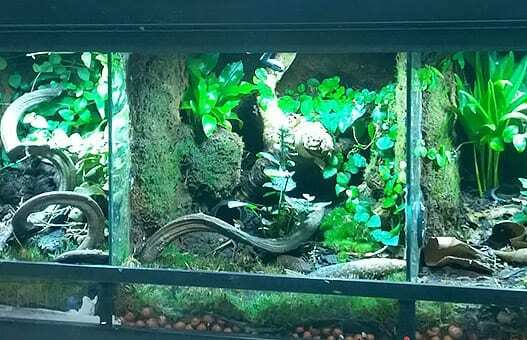 Depending on species requirements we provide vivaria with underfloor heating (ideal for Leopard geckos and Corn snakes) and overhead ceramic heating (for basking species such as Bearded Dragons and tortoises) – the vivaria are also provisioned with UVB lighting as required. Daily maintenance is of course provided and the correct diet is strictly adhered to with excellent quality foodstuffs. Our highly experienced team are able to provide boarding for even the most delicate of species. An in depth sheet will be completed by the boarder before we allow the animal to board. Over the many years we have all been involved in keeping exotic animals we have someone here that can speak at various levels – from kids to veterinarian. We have several stock presentations but can also cater for bespoke talks, slideshows and lectures to cater for specific requirements. This can even include live animals. 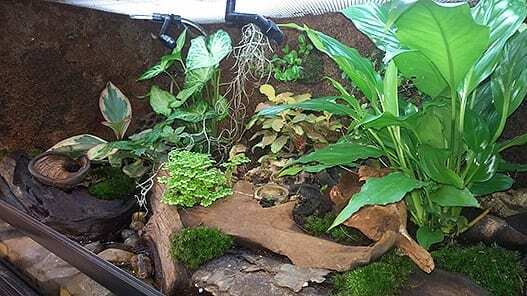 We have become well known for our various academies – our “Building Natural Terraria” is especially popular. We have a new academy to add to our portfolio, this is our “Exotic Animal Photography” academy in conjunction with Graeme Skinner, well known natural history photographer (some of his work is featured in this website). These are held periodically at various times of the year and generally announced on our Facebook page well in advance. We can provide a full bespoke build, partial build or accompanied (learn as you build) to your requirements. This can be rainforest, desert,, marsh, scrubland, or aquatic using a variety of material methods to construct such as polystyrene sheet, resin or expanding foam. A variety of live plants can be utilised and we will even populate with clean up crew custodians to ensure a healthy microclimate system. Once finished our work is a slice of living habitat, a work of art and a piece of décor to be proud of. Waterfalls, streams and pools can be created to the species requirements – and we even build just as plant terraria – no animals. Fully automated spray systems, heating and lighting can all be installed to your requirements. We are proud to have fitted animal care units in various colleges over the years and helped and advised many more. We can provide lectures through to installation of multiple vivaria, fully installed in refurbs or new build units. We provide a cost effective alternative to the big companies with the unique combination of fully understanding the animals requirements too. We can, like the colleges, fully install vivaria in any multiples to those discerning shops that want to feel confident in knowing they have provided the best standards in animal housing. Cost effective and thorough with a personal service based in a quarter of a century of exotic animal retailing.